The For Beloved One skincare from Taiwan and their hydration ranges have had a long standing reputation in Asia. As you know hydration is the key to our healthy and glowing skin. One of the hallmarks of youthful skin is its moisture content. For Beloved One Hyaluronic Acid Moisturizing Series is their latest upgraded hydration range that has pioneered the “Water-Activating Circulation Technology”, containing Hyaluronic Acid activating agent Exo-H which not only captures and replenishes moisture, but also creates moisture to achieve comprehensive moisturizing effect. So why is hyaluronic acid important for our skin? The magic of this ingredient lies in its ability to retain moisture; it’s considered to have a greater capacity to hold moisture than any other natural or synthetic polymer. In fact, according to research one gram of hyaluronic acid is able to hold up to six liters of water. For Beloved One Hyaluronic Acid Moisturizing Series not only utilizes high quality hyaluronic acid but also provides a comprehensive self-hydration and water circulation mechanism, and contains patented ingredients such as Malachite extract which is rich in copper element, the all-new Oligo GGF™ Raffinose and Ichtyocollagene™ marine collagen to create supple skin that is hydrated 24 hours a day and is also suitable for sensitive skin. The wrinkle formation is the result of dehydrated skin. Therefore, replenishing and maintaining moisture is in essence helping us prevent the appearance of aging signs. In addition to Hyaluronic acid, the all-new enhanced Hyaluronic Acid GHK-Cu Moisturizing Serum, Lotion and Bio-cellulose Mask have been added the precious ingredient [GHK-Cu] to stimulate the production of collagen to keep the skin supple. This is the all-time star product. I love the cellulose mask texture, it just stick to the skin and there is no solution dripping when I apply the mask. The effect after the mask is really awesome. The mask gives 24-hour moisture, instantly repairs and rejuvenates skin. 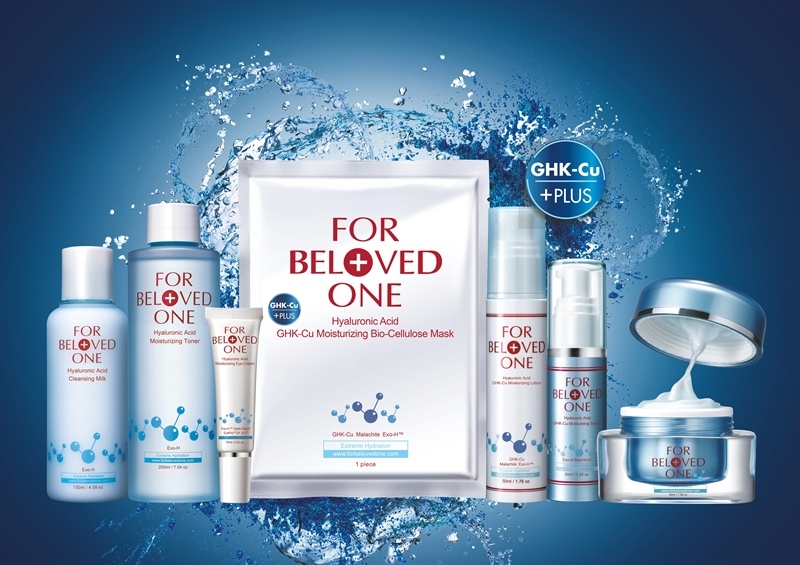 For Beloved One Hyaluronic Acid GHK-Cu Moisturizing Bio-cellulose Mask uses the unique “Water-activating technology” to capture, replenish and create water. Other than making use of top quality large and small hyaluronic acid molecules it is equipped with “uto-moisturizing active hyaluronic acid molecules Exo-H technology", ensuring the capture, replenishment and generation of moisture for the whole day, which not only effectively maintains moisture in the skin but can help skin capture moisture automatically at a deeper level. This is the friendly day moisturizer for the hot and humid weather. It is not oily or too rich. I like the lightweight texture and also the hydration effect. With the addition of Enhanced with premium copper peptide and rare minerals such as Malachite, this moisturizer is powered to retain moisture and enhance skin rejuvenation, keeping skin supple and radiant, activating the skin's ability to renew itself daily. The liquid gel texture enables fast absorption. It’s not oily or stick or oily. It works gently but effectively in all skin types and also sensitive skin. The serum enhanced hydration with GHK-Cu to remove wrinkles. It contains three types of Hyaluronic Acid to comprehensively capture, replenish and create moisture and precious ingredient GHK-Cu (copper peptide) that works together with collagen to moisturize the skin and delay the aging process. The serum helps to lock in the moisture and keep our skin continuously moisturized for 24 hours a day. Usage: After toner, apply it on the face to massage until fully absorbed every morning and night.